Google held its annual shareholder meeting on May 13, 2010. Google offers shareholders a free lunch every year. The picture above shows the kind of food available (in case you're wondering, yes, I did stuff my face). I really enjoyed the rice and chocolate eclairs. CEO Eric Schmidt briefly mentioned Google's great results, saying "All is well after a year of great turmoil." During the meeting, Mr. Schmidt showed a fun commercial for Chrome called "Chrome Speed Tests," which highlighted the web browser's incredible speed. I thanked Larry Page for showing up this year and asked him what he thought was the next "big thing." Mr. Page said that Google Translate is going to be a game-changer. The two-thirds of the world's population not yet online will greatly benefit from fluid translation services, which can be used in telephones and other mobile devices. CEO Schmidt mentioned Google's plan to enable people to text-message in their native language and have it automatically translated into the receiver's native language. Although most of the world's populations do not have ready internet access or computers, many people have mobile phones, even in so-called "Third World" countries, so an effective translation service would connect almost the entire world together. Later, I thought about how an automatic translation service could preserve some little-used languages, which in turn could help preserve a small country's or people's cultural heritage. I also think it would be wonderful if a small business-owner who speaks only English could sell products directly to someone in China or other countries. Down the road, if Google creates a program that translates spoken languages, American business-owners could more easily hire and sell to immigrants who may have difficulty speaking perfect English. In addition, older immigrants--who may have difficulty learning and speaking English--would be able to communicate better with their grandchildren and the general public. One side note: I thanked Mr. Page for attending this year and said I was feeling sentimental about previous meetings, where the atmosphere was more casual and he and Sergey would be dressed in jeans. Mr. Page immediately gave props to CEO Schmidt, touching him on the arm and reminding me that CEO Schmidt was also present at previous meetings. CEO Schmidt then joked that he also wore jeans at the previous meetings. I thought it was a great moment, because sometimes, founders and successors don't get along (e.g., Accuray, Inc.) and besides, who doesn't love a billionaire bromance? Google had a product demo section, where I discovered sites.google.com. I coach youth basketball, and I've always wanted to create a website for my teams, but I've never had the time. Well, Google has already done it for me and other coaches. If you go to Google's "sites" page, you will find a template called "Soccer Team" that can be used to post game times, agendas, and pictures. It's a ready-made website that community centers, YMCAs, and private clubs can use to help streamline programs and help their players keep in touch. There were some embarrassing moments for Google. Google received multiple complaints about the responsiveness of its Investor Relations department. One shareholder complained that Google took three weeks to return her phone call. Another shareholder said she was unaware of the annual meeting because she never received a proxy or an email notification and made it to the meeting only because a friend told her about it. After the meeting, several shareholders went to the front to speak with CFO Patrick Pichette about their issues receiving proxy materials and notices. Mr. Pichette was very patient and explained that Google may be slower to respond to individual phone calls than other companies because of its engineering mindset. He said that Google was an engineering company, and engineers tend to think that if something is done properly, all the information is available online and there is no need to pick up the phone. I don't understand why the company's CFO was handling these kinds of complaints. Typically, routine shareholder complaints would be handled by Investor Relations, not the CFO. At the same time, perhaps CEO Schmidt didn't feel comfortable referring shareholders to Investor Relations because shareholders were complaining about that particular department. I've raised issues with the way Google's Investor Relations Department treats shareholders before. For one thing, Google doesn't permit any questions or comments during the shareholder proposal portion of the meeting. It allows a shareholder to set forth a proposal and then moves directly to a vote. If other shareholders have information or comments about a particular proposal, Google does not allow them to express themselves until after the proposal has been voted on, making comments a moot point. A more reasonable course of action would be to allow comments, but to limit the comments to one minute or less. In most companies, Investor Relations is an overlooked and underutilized department, and I've never understood why. Investor Relations is the first place shareholders look when they have issues with a company, so if the department is stocked with unprofessional employees, the entire company's reputation suffers. It's funny--I've attended McAfee's annual meetings twice, and each time, I think I was the only non-employee there. 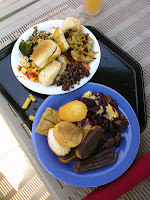 Yet, each time, the company had large tables of food and drink available. It appears that McAfee's Investor Relations department uses the annual meeting to fatten up the Board and treat non-employee shareholders like lepers. What's even worse is McAfee's competitor, Symantec, runs a great annual meeting and gives shareholders free software or other useful items. If you're a consumer company, why give people an excuse to favor your competition? Anyway, back to Google. One Google employee seemed to think that shareholders could easily print out proof of ownership of shares and bring that to the meeting for admission. The problem is that you have to own shares as of the "record date" to attend the meeting, and the record date is typically several months prior to the annual meeting. So if shareholders come in with a current printout of their holdings, that wouldn't necessarily entitle them to admission, because they could have bought the shares after the record date. I'm not saying these issues are simple, but why have Investor Relations departments if they can't help ordinary shareholders navigate the increasingly complex world of shareholder proxies and regulations? Shareholders who have issues with their proxies need to be more pro-active. Many Investor Relations employees don't seem to understand the machinations involved in individual shareholder notices because so much of the work is outsourced. Here's my advice to shareholders who stopped receiving annual meeting notices and proxies in the mail: contact your brokers and tell them you want to elect to receive copies of your proxy materials by mail. You have to actively opt back into the hard copy system if you want paper copies of shareholder materials. After July 1, 2007, companies no longer have to mail you hard copies of proxies and may email you a link to their materials on-line. Unfortunately, with all the online spam, some shareholders may not be getting notices because emails are being diverted into their spam folders. I will close on a positive note. As most people know, Google offers its employees tons of perks, but I discovered two more of them: on-site washers and dryers and smoothies made-to-order, including a delicious banana/chocolate combination. It's good to be King, and right now, Google is the King. Long live the King.